NEW YORK / PHILADELPHIA - Former restaurateur turned Restaurant Designer Raymond Haldeman who’s exploits in the hospitality industry have been well publicized in such notable publications as Gourmet Magazine, Bon Apetit, The NY Times and Town & Country, says the question of whether to Rebrand has dogged many a bar & restaurant owner. Although many are employing this increasingly popular trend very little has been written about it. As with restaurant operations, restaurant rebranding is a comprehensive endeavor and owners must be honest with themselves when they assess their shortfalls and address the right strategy for meeting their businesses needs. A cosmetic make-over will not change or improve your image if the the food and service still lack consistency. However, a designer-rebrand when combined with improved kitchen function, the right menu, a price point that services your locations demographics and an upgrade to the server’s knowledge & attitude can provide an immediate “about-face” for any operation experiencing declining sales & waining popularity. Yes, a Rebrand can, IN ONE DAY, provide you with a new start. In one day, sarcastic Yelp reviews will disappear forever, in one day, cold food, bad meals and long waits experienced by customers are forgotten. In one day, you have an opportunity to mold and craft public perception anew. This upside of restaurant rebranding when approached comprehensively can put any restaurant back on the road to profitability and give weary operators a reason to be excited and optimistic about the future of their establishments once again. If you plan on using a designer for your restaurant rebrand, please be aware that most interior designers, without having experienced the actual management of “day to day restaurant operations” unwittingly sacrifice function for visually appealing design. This shortfall can be costly to you, the operator as it can detract from the efficiency of your operation and marginalize the efforts by your professional staff to provide the ultimate dining experience for your customers. It is critical that you align yourself with a professional who is intimately familiar with running a restaurant and has a track record of successfully rebranding restaurants that were losers and reintroducing them into the marketplace as winners! Restaurant Rebranding does cost money as it is important that you remove any trace of your previous operation so restaurant patrons experience your reinvented eatery as new, valuable and exciting. By the same token, it is still the best option available and also a bargain when you consider you are able to create a new income stream under your current overhead. Remember you are not starting from zero, your lease is in place, the infrastructure exits, the kitchen is operating, the bathroom plumbing exists, the zoning is there, you are intimately familiar with the market. Now you can start developing a concept by carefully and thoughtfully applying all your wisdom into your rebrand and get it right the “second time” by addressing all that you now know needs fixing. Make a plan, schedule time for the construction and get started. The following is outline of a recent Rebrand by Bar & Restaurant Designer and Rebrand Consultant Raymond Haldeman. A winning combination for a Restaurant Rebrand is the integration of efficient & functional design with WOW-FACTOR which will maximize your brands appeal. 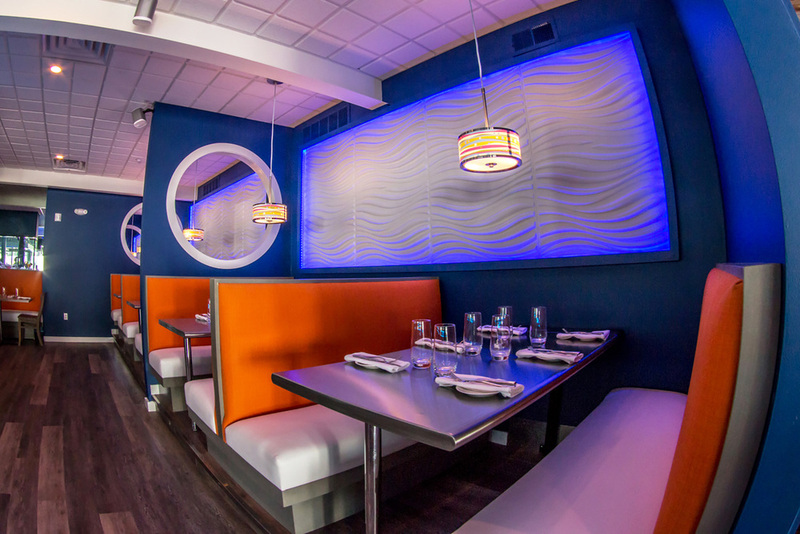 This powerful combination is evident in Restaurant Designer Raymond Haldeman’s latest rebrand & design fete, "FINS Bar & Grille” located in Cape May, NJ, a quaint and sophisticated Victorian hamlet on the southern most tip of the Jersey shore. Operated as the former Pilot House for over 3 decades, the restaurant was purchased by a group headed by Jeff Gernitis who kept the restaurant operating for several months while formulating a rebrand plan. During this time Jeff and his partners set about familiarizing themselves with the nuances of the location on Washington Street Mall a pedestrian promenade of shops and restaurants, about a mile away from the oceanfront front site of the iconic Peter Shields Inn & Restaurant which they also own. Gernitis gave Restaurant Designer Raymond Haldeman free reign in the conceptual theme and functional details of the redesign and the seasoned designer took full advantage of his confidence. Haldeman decided to exploit the city’s excellent reputation as a tourist destination by creating a beautiful and unique concept that would also propel the restaurant into the town's “Top Must-See Tourist Attractions” that would appeal to all ages. If an hour and half wait for a table at 7PM on a Wednesday evening is any indication, this goal was most certainly accomplished the day they opened. The entire space was gutted to "open concept status" and then large design elements such as two 12’ aquarium-walls and a 10’ see-thru stainless steel and barn-wood fireplace were custom built and installed to break-up the vastness of the space, separate the bar from dining areas, and enable the operators to shrink & enlarge the space as needed depending on the day of the week and time of year. Ultimately Haldeman went with a Casual & Contemporary Aquatic Theme using 700 linear feet of soft, dramatic and glowing LED lighting, detailed architectural craftsmanship and quality finishes. *CLICK HERE TO SEE WHAT HE DID!